Help repair the railroad and prevent the company from going bankrupt. 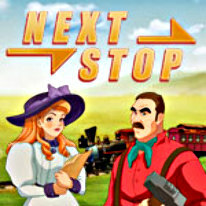 Next Stop is an exciting Time Management game that will send you on a high speed trip down a dilapitated railroad! Make all the stops and perform the required repairs at each stop before the bank reclaims the railroad to offset its debts. Collect the necessary resources, always ensuring you have enough and assign tasks to the workers. Revive the ailing railroad, save it from bankruptcy and in time perhaps even earn a substantial income for yourself!